1. People and specific contacts. 4. Building History from 1200 AD and Church Yard. For many people locally, their only knowledge of St. Michael's Church is a sign at the traffic lights at the end of Minster Road. In fact, there has been a church on this site since 1200 AD, housed in four different buildings over the last 200 years. When the third church building of the early 1900's was badly damaged in a storm in 1976, a competition was held for the design of a new church and, since 1980, St. Michael's has enjoyed the facilities and flexibility offered by a comfortable and accessible modern building. A large parish room is also on the site, providing space for many diverse activities and social events. It has an attractive setting in tranquil gardens within the walls of the previous church. The central altar was introduced after much consultation to complement the unique and graceful shape of our modern church. The Organ was built specifically for the church by William Drake, Organ Builder, from Buckfastleigh in Devon. The building houses the embroidery panels produced to mark the 1300th anniversary of the Diocese of Worcester members of the Stourposr Deanery. They are especially interesting as they show the Deanery structure as it was at the time. The font is believed to be 18th century, made in Worcester, and was in both the previous two churches. It was moved from the second church in to the third church where it was elevated on stone steps. 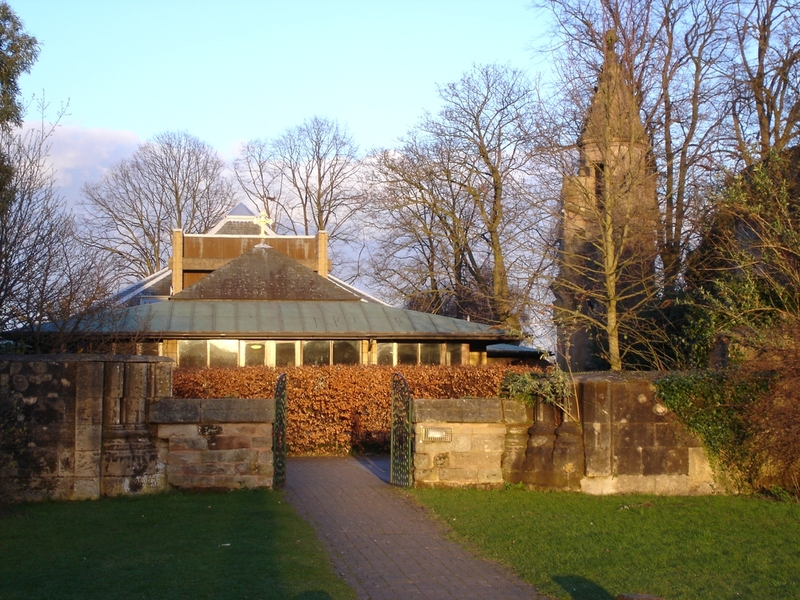 It was shortened and remodelled for the present church and represents a link across the years of baptisms in Stourport. Design and Manufacture of the new furniture. Luke Hughes. The project of the new church was first brought forward in November 1875. This was before the days of Parochial Church Councils and so in 1876 the parishioners, as represented by the Vestry, were unanimously of opinion that such a course of action was definitely desirable. There was no difference of opinion as to the need of a new church although there was a divergence of opinion as to the sort of church which should be erected. The old church was not an architectural gem. Its acoustic properties left much to be desired, the seating accommodation was inadequate, and the position of the pulpit was inconvenient. The Vicar, the Rev. Benjamin Gibbons, took the initiative and asked Sir George Scott to design a Gothic Parish Church which would be a worthy building. The architect produced two sets of plans, one of which would cost about £29,000 and another which might be erected at a cost of approximately £11,000. The more expensive plan was adopted, and Messers. Collins of Tewkesbury were awarded a contract, the corner stones being laid in April 1882. In 1887 the porch was built, and soon the south wall was erected. By 1908 the nave was roofed, but neither the east end nor the west end was closed in, there were no doors and the interior of the building was exposed to the weather. The sum of £18,000 or thereabouts had been spent on the foundation and the nave, the bulk of which had come from the private purse of the Rev. B. Gibbons. The Bishop of Worcester, Dr. Yeatman Biggs, insisted that vigorous steps should be taken to equip and complete the nave for use as a parish church. The church was never completed. The picture above shows the completed nave which was bricked up at both ends, consecrated and came into use in October 1910. In spite of his advanced age, the Rev. Benjamin Gibbons was able to be present. The picture on the right is of a model of the church as proposed and shows the final proportions of the Church as originally designed. The Tower and the Chancel were never built. The old church of 1792 stood unused until after the first World War, when, having suffered vandalism, it was pulled down. By the 1970s the church was proving itself unsatisfactory. It was still unfinished. It was extremely expensive to keep warm, the heating system was old, its huge capacity was used on only two or three occasions in the year; moreover, the soft sandstone of which it was built was eroding badly, especially the high parapets below the steeply sloping roof which were, as a result, becoming unsafe. On January 2nd, 1976 a storm ripped off part of the roof at the west end, thus precipitating a decision that would have had to be made sooner or later. When the Ecclesiastical Insurance Office settled for £13,247 it became apparent that to repair the church would only be to perpetuate its inherent problems. Instead, after extensive discussions, the insurance money was used to start a fund to rebuild. James Brindley (1716-1772), sponsored by the Duke of Bridgwater, built the Staffordshire and Worcestershire Canal. This led to the building of the inland port and modern Stourport was born. The old church soon became inadequate. It was proposed in a Brief of George III dated 30th July 1781 to raise money to take it down and rebuild it, when it was described as "a very ancient structure and greatly decayed in the foundation walls and roof, and notwithstanding the inhabitants have from time to time laid out several considerable sums of money in repairing it, yet the same by length of time is become so very ruinous and decayed in every part that it cannot any longer be supported but must be wholly taken down and rebuilt; and the Chapelry being lately increased in buildings and inhabitants by the addition of many houses and families at Stourport." On February 27th, 1785, notice was given that a public vestry meeting of the inhabitants and paymasters of the chapelry of Mitton would be held to make application to the Bishop of the diocese for a licence or faculty to take down the old building and erect a new one on the same site, or as near to it as possible, using the old material as far as it would go. In the petition to the Bishop, signed at the meeting by thirty-four parishioners, the church was described as "old and ruinous and too small to contain decently and commodious all the inhabitants of the chapelry to hear divine service". The population had rapidly increased owing to the construction of the canal "which forms a junction with the river Severn at a place called Stourport, situate in the said chapelry of Mitton" which chapelry is now described as "a large and populous place". The Bishop of Worcester replied promptly to the petition, and cited all who were interested to appear in the following April to show cause, if they thought fit, why such a faculty should not be granted. There were only five objectors and eventually a faculty was granted, dated March 25th, 1788. The demolition of the old building and the erection of the new one was now undertaken, and the whole of the work was fully completed by 1792. This new building resembled Wolverley church. In 1833 the question of the enlargement of the church was discussed, the accommodation being manifestly inadequate. The population of the hamlet was estimated at 3,000 and the chapel only contained 450 kneelings. The cost of the plan submitted was £1 ,3 10. The scheme was to add 560 more kneelings, 364 of which were to be free. This extension consisted in taking down the east wall and chancel, and rebuilding the chancel and a transept. The transept was 62 feet across and 27 feet 6 inches broad, the length of the church being thereby increased from 52 feet to 79 feet 6 inches. The new chancel was of just the same dimensions as the former one. The desirability of separating the chapelry of Lower Mitton from the parish of Kidderminster had often been discussed, and on the death of the Rev. James Turner, Vicar of Kidderminster, a memorial was sent to the Bishop of Worcester, calling his attention to the ecclesiastical state of the hamlet of Lower Mitton, then better known as Stourport. The hamlet had its own parochial officers, maintained its own poor, was separately assessed for all county purposes and had no connection whatever with Kidderminster except ecclesiastically. The curate was appointed by the Vicar of Kidderminster, there was no residence for him, and they were given to understand that it was optional whether he were resident or not. These ecclesiastical arrangements had probably been made in the time of Queen Elizabeth, when, according to a census then taken, the hamlet contained only 22 families or about 90 inhabitants. With regard to Upper Mitton, where there were 223 inhabitants and about 320 acres of land, the tithes belonged to the Rector of Hartlebury, but otherwise they had no connection with Hartlebury. Most of the respectable inhabitants had pews in Mitton church, and being two miles from Hartlebury nearly the whole of the inhabitants attended divine service there. It was therefore suggested that Upper and Lower Mitton be united, and form a separate parish for ecclesiastical purposes. The Bishop of Worcester fully approved the plan of uniting the hamlets. The new parish of Stourport was accordingly formed on 19th June 1844, the Rev. Charles Wharton (a native of Stourport) being the first incumbent. Following the consecration of the Third Church in October 1910 the church of 1792 stood unused until after the first World War, when, having suffered vandalism, it was pulled down. It's foundations can still be found in the church yard by the entrance from Church Avenue. As long ago as the year A.D. 1200 there was a church of St Michael at Mitton. It had been founded to supply the spiritual needs of a district nearly four miles away from the mother church at Kidderminster, and we read about that time of Philip the chaplain of Mitton. With the exception of the chapel of the Assumption of the Blessed Virgin Mary, and its chantry founded at Trimpley in 1370 with William de Pedmore as its chaplain, the church at Mitton remained the only chapel of ease in the parish of Kidderminster for more than 500 years, when the chapel of Christchurch in Wribbenhall was built in 1701.
tithe of rye, 16s. 8d. tithe of beans, peas and vetches, 1s. 9d. The altarage with the live and dead heriots which were ordained for the service of the chaplain amounted to 53s. 4d. making a.total of £4 18s. 9d. One chalice of silver with a paten. One pair of vestments of silver, which were old. One cope of motley colours, not silk. About this time the chapelry of Mitton consisted of twenty-three families. The next mention of the chapel of St Michael at Mitton is the inscription on a tablet now on the wall in the narthex of the present building. "This chapel with the yard was consecrated and made a burial by the Reverend Father in God, John Lord Bish of Wygorn, November the 6th, by means of John Yarrenon and John Wilks, Churchwardens, with the inhabitants of Lykhill and Lower Mitton, Ano. 1625." A further inscription tells us that "the chapel was repaired and beautified by the inhabitants of Lickhill and Lower Mitton and this last was built by Pynson Wilmot gent, he being chappell warden for the year 1707". We know then that a church of St Michael has stood on or near the site of the church for several centuries, but we have no knowledge of what the earlier building was like. History researched by Canon Reginald Chesshire, Vicar, 1920. Revised by Canon Patrick Fedden, Vicar, 1982. Edited for the Web Site, 2002. The Churchyard is one of the largest in the country and is home to a wide variety of trees, plants and wildlife. We operate a policy of encouraging the wild life to develop alongside the needs of a public church yard by limiting the amount of grass cutting, keeping only the foot paths mown. The remainder is tended and cut down as necessary but limited to encourage the natural habitat. Over to the South of the Church, by the entrance from Church Avenue, you will find the foundations of the Church of 1792 demolished shortly after the first world war. This is now used as a burial place for ashes. If you continue to wander from the old foundations down the bank to the canal bridge you will pass on your right the later part of the Church Yard where you will find the War Graves. The white memorials are the Baldwin family tombsIn the older parts of the Church Yard there are some interesting graves for the historian. 28 members of the Baldwin family who lived between 1725 and 1938 are buried here. The memorial Tombs, seen in our picture, were made in cast iron at Baldwin's Wilden Foundry. In 2000 these tombs were restored By the Stourport Civic Society, the recasting being carried out at the Ironbridge Gorge Museum. The tomb of GEORGE NICHOLSON (d. 1825), a pioneer in popular publishing can also be found. This has also been recently restored. AARON YORK (d. 1797), a friend of John Wesley who helped to develop the canal. DAVID DAVIES (d. 1832), priest-in-charge of Mitton 1782-1829. RICHARD HEATH (d. 1850), a parish benefactor. Also buried here are JOHN MURRAY (d. 1868), a veteran of Trafalgar and GEORGE HARRIS (d. 1876), a veteran of Waterloo and one of the earliest carpet manufacturers.